Spring Break is a wonderful time to rest, rejuvenate and get inspired for the times ahead. Borges Family Carriage & Sleigh Ride’s Crew are going on a business retreat to celebrate our winter labors, prepared for driving and safety proficiency while the Horses get some Pasture Time! Yahoo!! Enjoy your time together with friends & family! Offering 30 minute narrated tours to Lake Tahoe, along her shores and back to 4130 Lake Tahoe Blvd. 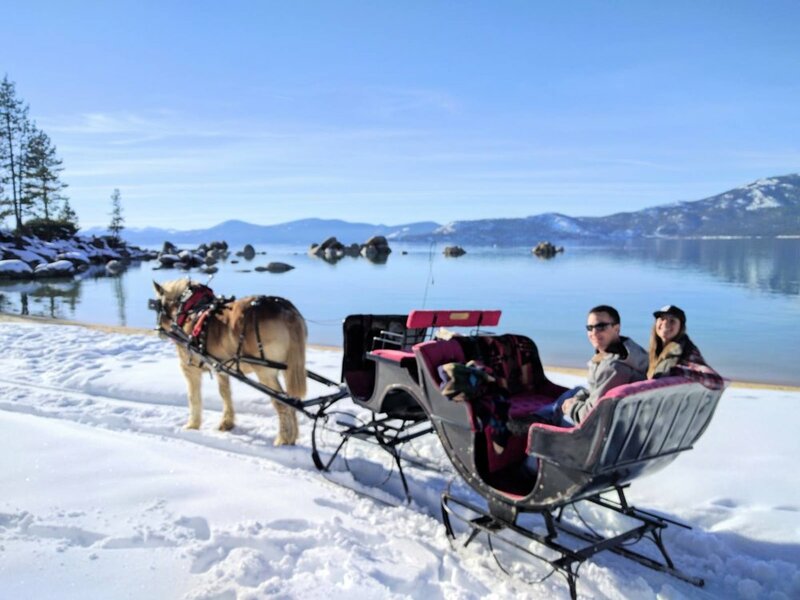 Sand Harbor locations closed & Sleigh Rides on snow closed for the season. Sleigh Rides on Snow are closed for the season. See you next year!! It is regrettable that we can not open any Horse Drawn Activities this weekend. Sleigh Rides on Snow CLOSED for the Season! Sand Harbor Visitor Center ( Nevada State Park, Lake Tahoe) is 3 miles south of Incline Village, off hwy 28. Sand Harbor Visitor Center is located inside of the Lake Tahoe Nevada State Park at Sand Harbor off of NV State Hwy 28, just 3 miles south of Incline Village. Go in through the Main Entrance to the Visitor Center where there is a kiose with a receptionist and horses will be waiting. There is a $10 parking fee to enter the park. We accept MasterCard/Visa/Cash for your ride at the kiose. due to High Winds and Poor Snow Conditions. Please read prior posting for addition explanation.